Even in this big world we live in it is easy to feel alone in our struggles. The challenges of life can often cripple us, make us frustrated and sad. Reaching out and finding others that have or are going through the same experience won’t take away the pain, but it can give us hope and guidance. That’s what Jessica Dobbs did when faced with loneliness on the mats and when she did she found more support than she ever imagined. Jessica Dobbs is a brown belt at No Limits BJJ. She is a bank teller by day and assistant instructor by night. She has been training for six and a half years. When she is not working she says she likes to spend her time painting, traveling and try new things. Jessica has been a long time Martial Arts enthusiast. She started with Tae Kwon Do and discovered Brazilian Jiu Jitsu when she was looking for a ground based martial art for self defense. But what she found was camaraderie of the sport and competing which has become a big constant in her life. She says if she has a stressful day, she can come to the mats and release it. Even if it was a bad day on the mats, it is still better than a bad day off the mats. Jessica says as a white belt and the only female at her academy she would often get really discouraged. Especially when all of the other guys who were also starting out could use their strength against her. It made her feel like Jiu Jitsu was ineffective. But at the same time it made her push harder, persevere and made her a more technical practitioner because she was able to learn and apply the techniques the right way without strength. Although at times she felt alone in her struggle, Jessica turned to the internet. 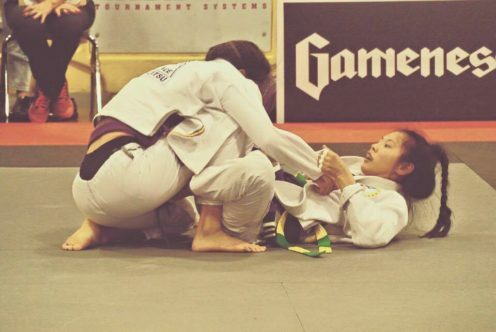 She discovered blogs, organizations like Girls in Gis and she made lots of friends with other Jiu-Jitsu girls on social media before she actually met them. She says this helped to keep her motivated, inspired her and made her feel not so alone. According to Jessica it is so important for girls and women to train with each other to see that they don’t face challenges alone, because there is strength in solidarity. Jessica also says if you are a competitor, it’s good to find other ladies in your weight class to help push you, because ladies roll different than some guys and in her opinion are way more fierce. Having gone through the struggles of her early years Jessica began teaching women’s only classes twice a week as a blue belt. She says her greatest accomplishment is teaching and sharing the art in her community and watching young girls and women grow through BJJ.